Friday is over, but it was mental. In lots of good ways. 644 children in a hall is awesome, especially if you get them cheering and booing. 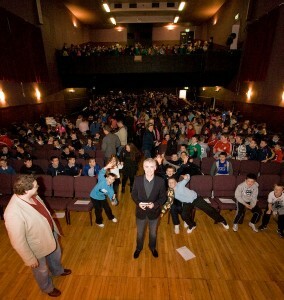 Eoin Colfer had them laughing and screaming and it was very good to see. It was a very full venue. The Oisin McGann Library talk was excellent, he is very personable with kids, but the best bit was at the end, the library are one of the venues where we have free comics, so the kids went into a bit of a frenzy at the end, taking comics. Was pretty cool. Chairman of the Bourogh Council, Anna Fenlon opened the festival, but councillors and TD’s in attendence. Dr. Emma J. King’s “Fun With Liquid Nitrogen” talk and instant ice cream, full house again, and hugely popular. Lots of cheering and excitement as the experiments took place. Followed by Eoin and Andrew Donkin’s amazing talk about the mechanics of comics, and something I think that should be seen again, elsewhere. Sarah Rees Brennan did a superb job leading the discussion on Paranormal Romace, while Bui Bolg were a costume workshop in an hour and half and good with it. 3 sewing machines on the go. Cosplay disco was more cosplay, live Gig, with teen band Discord. This is something that we need to change, having band(s) is great, much more real, the tech set up in WAC is amazing, beyond anything I have worked with before. 30 mins to go from discussion of set-up to full band rig – including monitors and everything. This entry was posted in Conventions and tagged James Bacon, WexWorlds by Mike Glyer. Bookmark the permalink.